Schedule additional or new writing assignments. There are two types of writing assignments that you can create for students. Writing Assignment: Request students to write something. You can require peer critiques, set a word count, choose if an assignment is optional. You'll need to be in 'Edit Mode' to add an assignment to your lesson. Click the 'Add Assignment' button. Title: A brief title of your assignment. Details: The detailed text of your assignment. You can use the formatting bar to create a rich description of your assignment including uploading images or embedding videos. Start Date: The date on which this assignment should be posted in the class. Set this to today if you wish to start this immediately. Due Date: The date by which students must submit their writings for this assignment. Make Assignment as Optional: Students will be asked to respond to this assignment but they will be notified that it is optional. Require Fountain File for Screenwriting: Choosing this option will require students to upload a Fountain file. Most screenwriting software can export to Fountain files. WetInk will display the formatted screenplay on which the class participants can provide feedback. Require Peer Critiques: Wet Ink has comprehensive built-in support for critiques. If you enable critiques for this assignment, Wet Ink will automatically ask students to create responses to this assignment. Specify the date by which students need to provide critiques. Add an Image: An image is automatically suggested but you can choose from additional suggested images, upload your own, or remove the image by using the buttons below the image. Enable or Disable Questions and Comments: This space is to ask questions or comments about the assignment. It can be turned on or off at your discretion. After you complete the type, title, details, and dates (if in a 'Running' class), you'll go to a screen similiar to the one students enter assignments. On the left will be the assignment details. In the middle will be the editor, where you will past your assignment text. To complete the assignment, you will need to hit 'Save' then the 'X' to close. 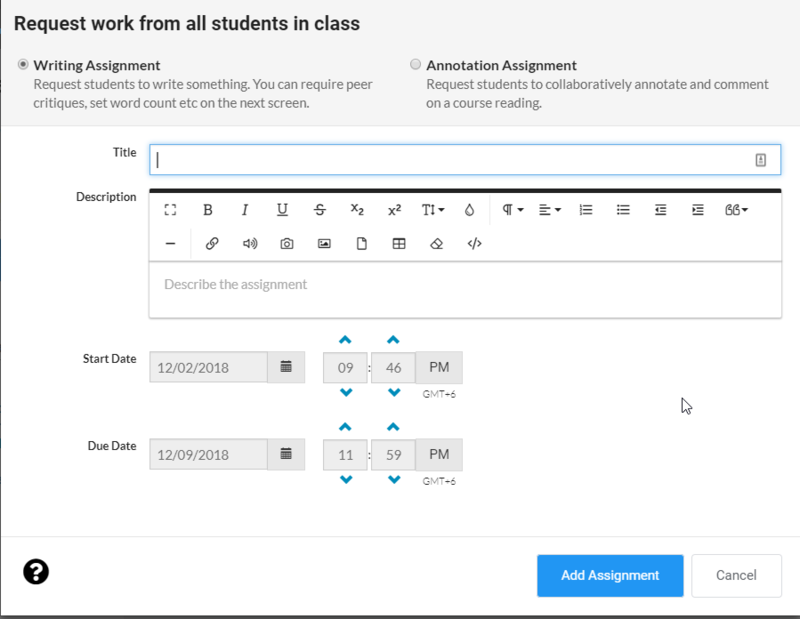 To add an assignment not connected to a specific lesson, you will go the 'Lessons' tab and choose 'Add Assignment.' You can then follow the same instructions as above.